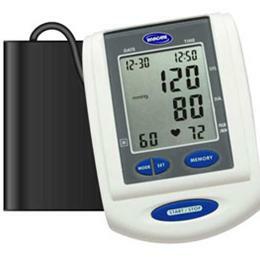 Provides accurate readings with a single touch of a button. Features a large digital display panel, a comfortable, easy to clean arm cuff and memory storage for up to 60 previous readings. Automatic power off function and AC capability to help conserve batteries. Cuff is easy-to-clean and durable, water resistant nylon with brachial artery marker and proper size range indications; fits arm sizes 9" - 13".